Visually inventive and enjoyably quirky, this is an entertaining western adventure with a strong voice cast and a terrific central performance from Johnny Depp, but the humour is so heavily reliant on film references and offbeat dialogue that it's likely to appeal to adults more than children. Directed by Gore Verbinski, Rango begins when a pet chameleon (Johnny Depp) who dreams of becoming an actor gets lost in the desert and, after a close encounter with a vicious eagle, finds himself in the no-horse town of Dirt. Partly in order to impress feisty lizard Beans (Isla Fisher), he reinvents himself as heroic gunslinger Rango and is swiftly appointed sheriff by the shifty tortoise Mayor (Ned Beatty). When Rango discovers that the town's water supply has gone missing, he vows to help and promises the townsfolk that he'll get their water back. 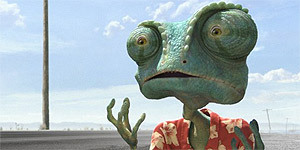 However, when he's threatened by vicious rattlesnake, Rattlesnake Jake (Bill Nighy), Rango realises he might have bitten off more than he can chew. Depp is terrific as Rango, adding just a touch of his performance as Hunter S Thompson in Fear and Loathing in Las Vegas (an early Thompson cameo confirms as much), which gives the film an unexpected edge. The voice work is excellent throughout, with the various big-name actors really committing to their roles, to the extent that some of the names at the end come as something of a pleasant surprise. Verbinski directs with an appealingly quirky visual style, allowing for some hilarious sight gags and lots of offbeat humour – the owl mariachi band are a particular highlight. There are also some superb action sequences (the bat chase is spectacular) and the script is packed with enjoyably geeky film references and wonderful off-the-wall dialogue that you'll be itching to hear again. The main problem is that the plot is a little too scrappy so there's no sense of urgency or momentum to the story, which meanders between set-pieces and eventually starts to drag as a result; it's also a good twenty minutes too long and comes down with a bad case of Spielberg's Three Endings Syndrome, with two endings too many. Visually inventive and superbly voiced, Rango is a lot of fun, though the allusions to other films and quirky dialogue mean that grown-ups are likely to enjoy it more than kids. Worth seeing.